It’s not often that I get asked to review a cat accessory that I actually think my cats would like, but when Cool Cat Collars contacted me asking if I was interested in doing a review, I said, “Absolutely!” You see, I do put collars on my cats–although around here we refer to them as necklaces–and they enjoy wearing them. I requested the Angelica Green Double Velvet for Tara, the Purple Glitter Velvet for Bella (you know how she loves sparkly things), and the Blue Tartan for Thomas. 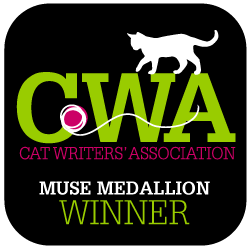 Disclosure: I received three Cool Cat Collars for the purposes of this review. 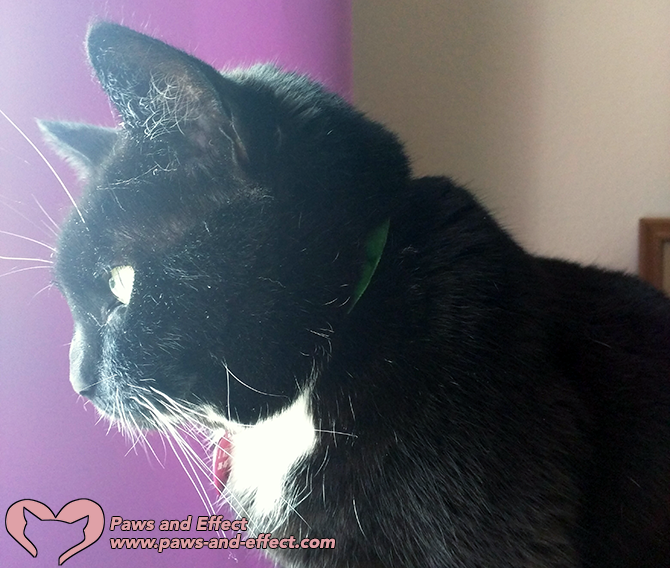 The opinions expressed here are my own, and Paws and Effect only shares reviews of products we think would interest our audience. 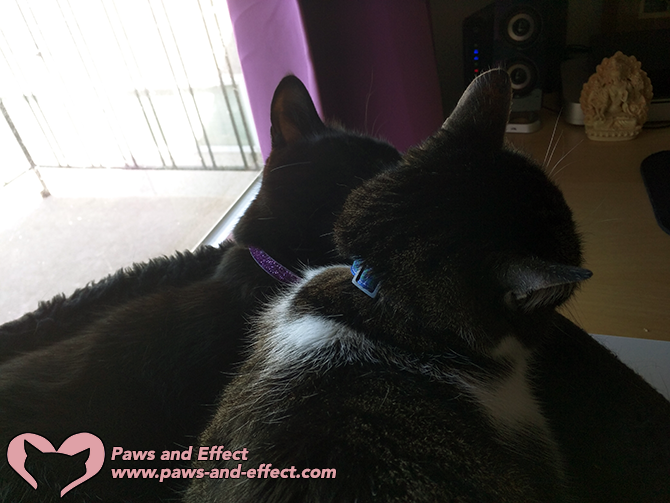 You’d think a collar is just a collar, but that is absolutely not the case with Cool Cat Collars. First of all, they’re handmade in the UK, which is a big bonus, as most collars are speedily machine-made in countries like China. The difference shows in the collars’ quality construction. Both the fabric and the stitching show attention to detail and a desire to make the collars as comfortable for cats as possible. The collars do come with bells, which I removed because the Paws and Effect Gang hates collar bells. Besides, there’s no need for bells since the cats don’t go outside and wouldn’t have a chance to hunt prey. Tara loves her new Cool Cat Collar. The Angelica Green Double Velvet collar I got for Tara is nice and soft, but it is still well-made. The folks at Cool Cat Collars recommend the double velvet collars for kittens and for cats just getting used to wearing a collar. 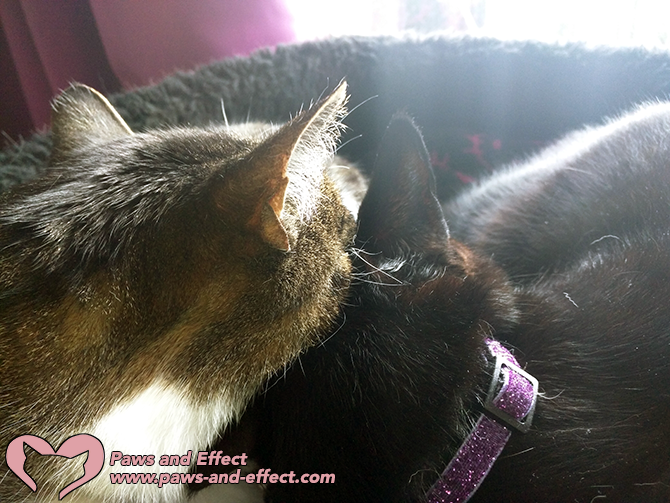 Thomas looks dashing in his Blue Tartan collar, and Bella looks sparkly in her Purple Glitter Velvet collar. Usually, sparkly collars tend to be a bit on the stiff side, but this wasn’t the case at all with Bella’s Purple Glitter Velvet collar. Thomas’s Blue Tartan collar looks lovely and is in keeping with his proper gentlemanly style. Here’s a close-up of Bella’s collar. In this close-up of Bella’s collar, you can see the quality of the workmanship. And the glitter shows no signs of wearing off any time soon. 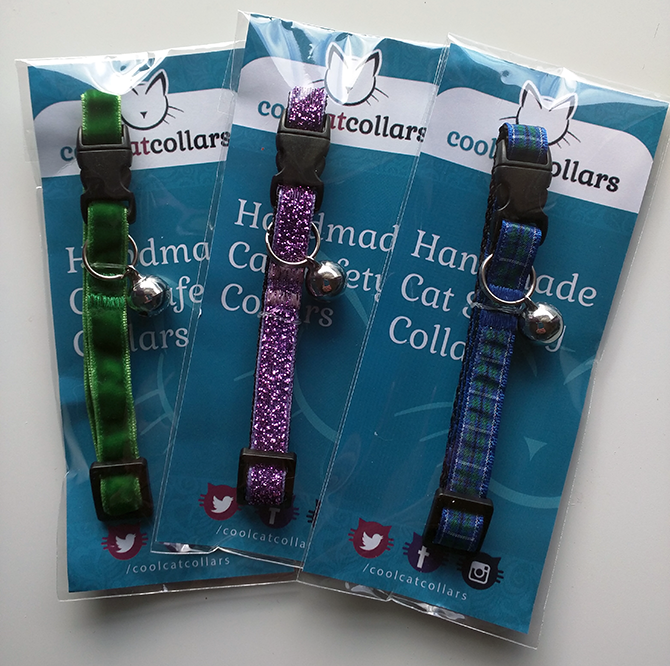 The folks at Cool Cat Collars say they can ship anywhere in the world, so there’s no excuse for you not to pick one up. They retail for £7.99, or about $10.24 US. UK delivery is £1 per order, and international shipping varies by country. Overall, I’m really impressed with the quality, range of styles and colors, and great customer service offered by Cool Cat Collars. Go visit their website: I dare you not to find a style, material, or color that wouldn’t look great on your cat and be comfortable at the same time!